1. Simmer the apples, butter, sugar, flour cinnamon and water until the apples are tender, about 10-15 minutes and set aside. 2. Mix the eggs, milk and vanilla in a wide dish. 3. Dip the bread into the egg mixture to coat on both sides. 4. Melt some butter in a pan and fry the slices of bread until golden brown, about 3-4 minutes per side. 5. 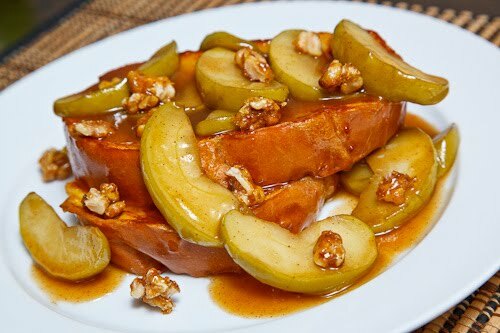 Serve the french toast covered in the caramelized apples along with some candied walnuts.